Alan Lathan was for many years the face of Jeppesen, the vital pilot’s guide, at the regular air shows such as Farnborough, Le Bourget, Dubai and Singapore from 1976 to 1996. After 43 years with the company Alan retired in 2008 and is now part of the back room team at Business Travel News. 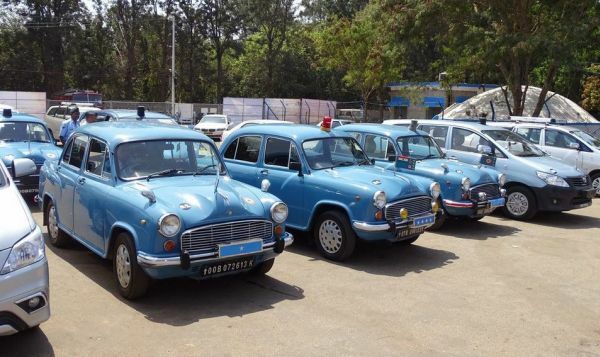 Alan recently visited Bangalore for the first time in 14 years, not expressly to report on the bi-annual air show “Aero India”, although a visit was on the cards. Here is what he has to say. He took the pictures too. 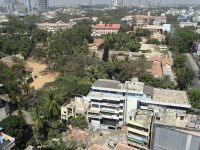 They used to call Bangalore the 'Garden City', but many now ruefully refer to it as the 'Concrete Jungle'. It is still a pleasant green place to visit, and the view from my friend's 13th floor office hasn't changed all that much. It is when you take, for example, the highway to the main airport that the tremendous amount of new development becomes apparent. The traffic at rush hours takes some getting used to, and it is said that Bangalore has the most two-wheelers anywhere in the world. You can wait up to five minutes at major crossings. Driving is a matter of give and take, and not once did I see anyone get heated up over the apparent lack of any traffic rules. In fact, I found it quite fun, rather like dodgem cars! Bangalore is great for shopping, eating, with masses of places to visit in the evening. Bangalore (or Bengaluru to give it its official 'new' name) now boasts a very efficient elevated Metro railway called 'Namma Metro'. Commercial operations on Reach-1 (MG Road to Baiyappanahalli station) opened on 20 October 2011 and those of Reach-3,3A (Peenya Industry to Mantri Square Sampige Road Station) on 1 March 2014. This is the first standard gauge metro rail project in India with a 750V DC third rail. Since my last Aero India back in 2001, I noticed a marked change in the aviation landscape. 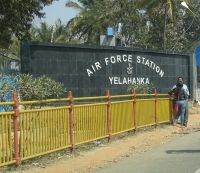 The Indian Air Force base at Yelahanka is on the Bangalore –Hyderabad highway between the city and relatively new (2008) international airport called Kempegowda and thus easy to reach. The old gateway, still called Bangalore just to confuse people, is in the heart of the city and used by executive aircraft and the military. It is now well organised, security is written large, and the airfield has taken on its role as exhibition venue with gardens, gate guards, and a good road system. Hangars which usually house Antonov An-32 transports and Dornier 228s play host to the exhibitors, the aircraft being parked across the runway on the north side where the helicopters live. Countries with an impressive presence included Russia, France, Israel, Ukraine, and India itself. Thales and Rolls-Royce had large booths, whereas the majority of British exhibitors were happy to take advantage of the ADS (former SBAC) trade block. Dassault had a big stand, with a number of Falcon aircraft in the static display. The Dassault Rafale is a serious contender for a major order from India, in competition with Eurofighter, and three aircraft were present. The USA sent two pairs of F-16 and F-15 fighters with a KC-135R refueller from Japan, and a C-17 Globemaster III from Hickham AFB Hawaii dropped parachutists. Two British display teams put up excellent shows, the Breitling Wingwalkers from Rendcomb, and the Yakovlevs from Henstridge. Well done! India excels in building things under licence, and this has also helped spawn its own indigenous aircraft industry, represented in the main by the State-owned HAL – Hindustan Aeronautics Ltd, and DRDO – Defence Research Development Organisation. In fact, the motto of this year's show was 'Make in India', a call from the PM Mr Modi to increase local production. I remember seeing the BAe Hawk demonstrator at the show in 2001, and during this year's show, the 75th Hawk to be built by HAL for the Indian Air Force was ceremoniously handed over. The Dhruv (Mountain) helicopter was very much in evidence, particularly in the form of their Sarang (peacock) demo team. The LCA – Light Combat Aircraft, now named 'Tejas' was in prototype form, and a naval version complete with arrester hook was also to be seen, along with the LCH – Light Combat Helicopter. In spite of that, I was surprised to see that India has purchased a number of airborne early warning aircraft based on the Embraer 145, as well as the C-130J Hercules and even the C-17 Globemaster, of which ten are on order. There were several drones (UAS, UAV) on display, both large and small. If you were looking for airliners you would have been disappointed, the only one I could find, on static display, being the Sukhoi Superjet 100. I had hoped to see an A350, but Airbus couldn't even rustle up an EC-135 helicopter. Between you me and the gatepost this was the real reason for my trip, since my good friend Arun Sharma is setting up a HEMS service under the name of Aviators Air Rescue. I wish him every success in his endeavour.